Udupi, Jan 8, 2017: Sanskrit literature has extremely valuable contents that can contribute to the welfare of the mankind. 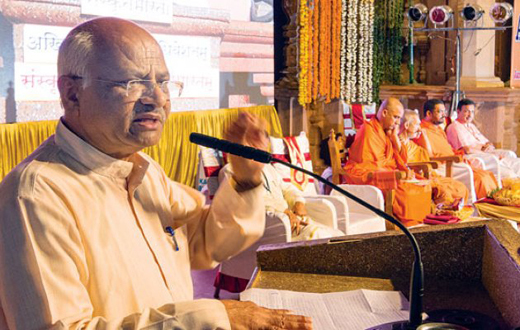 There is a need for greater research in this regard, said senior RSS leader Suresh Soni. Giving a talk on ’Sanskrita Bharatham - Samartha Bharatham" at the Rajangana of Sri Krishna Mutt on January 7, Saturday as part of the national convention of Sanskrita Bharathi, he said mankind can be taught culture (Sanskrithi) through Sanskrit. We have a vast treasure house of knowledge, we only have to find it, he added. Recalling former president APJ Abdul Kalam, Suresh Soni said that Dr Kalam had shown the way to progress even when there is a rise in corruption terrorism and other places, by stating that the lay man should be made aware of the nationalistic feelings while the extremists’ should be enlightened on religion. Sri Nirmalananda Swamiji of Adi Chunchanagiri Mutt, blessed the occasion. Sri Dharmapalanatha Swamiji of Mangaluru branch of the Mutt, Sri Vishwesha Theertha Swamiji of Paryaya Pejawar Mutt, Dr Bhaktavatsalam, the new President of Sanskrita Bharathi and others were present. There was loud applause at the venue when organisers informed that PM Modi has tweeted wishing success to the convention.